Tomorrow's event at the August Mega Stack Challenge is the $400 No-Limit Hold 'em Mega Stack event. It features 20,000 starting stacks and a $100,000 guaranteed prize pool. The action gets underway at 11am in the Foxwoods Tournament Poker Room! $1,200 Mega Stack Main Event Starts Saturday! The $1,200 No-Limit Hold 'em Main Event kicks off at 11am on Saturday, August 20th. The event has a $200,000 guaranteed prize pool and players start with 40,000 in chips. 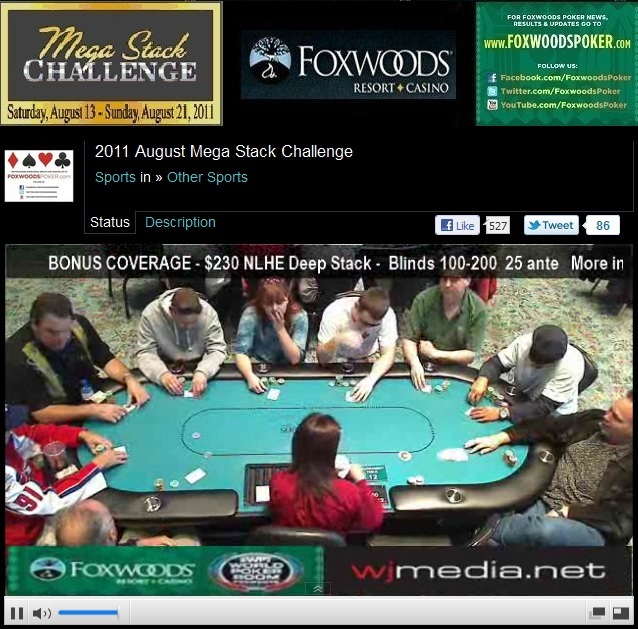 We are now live streaming bonus coverage of today's $230 N0-Limit Hold 'em Deep Stack event. The event had a $30,000 guarantee but drew 277 players, creating a total prize pool of over $53,000. First place will take home $12,898.